Hi there! Welcome to day one of the March Papertrey Ink countdown. I'm here today to share a few samples using one of this months new set... Wet Paint (designed by Nichole Heady). This stylish set features large words in a trendy paint stroke look and are perfectly sized to be used as a focal point, a background or supporting some of your favorite images. It's a wonderful set to play around with! Keep in mind that this set will be available for purchase beginning March 15th at Papertrey Ink. 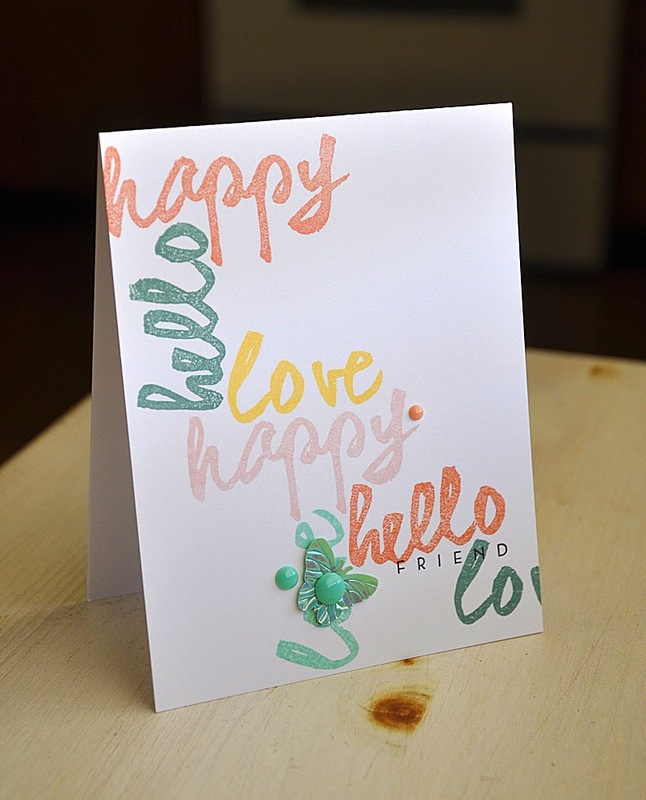 First up, a Wet Paint sentiment supporting a stamped watercolor background. 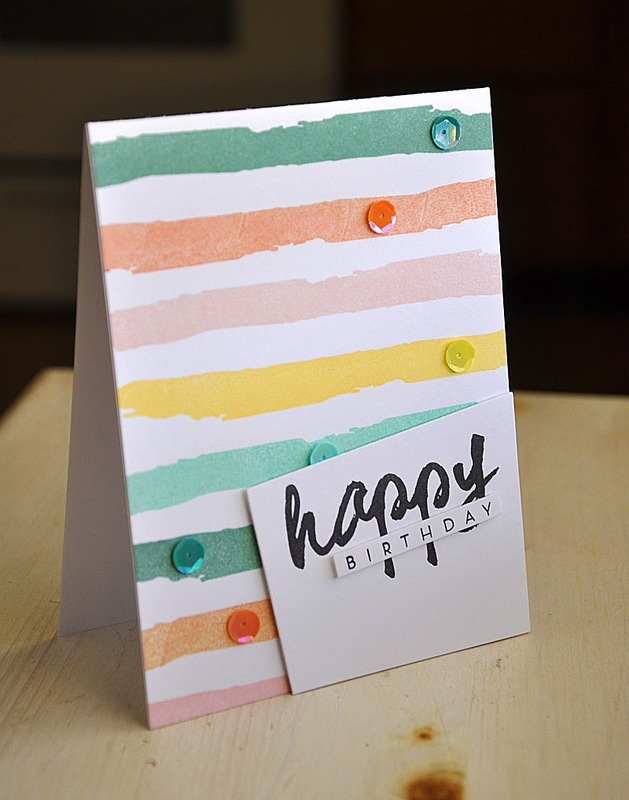 I hand stamped this watercolor stripe background using the Watercolor Wonder stamp set in a color combo of Sweet Blush, Melon Berry, Ocean Tides, Aqua Mist and Harvest Gold. 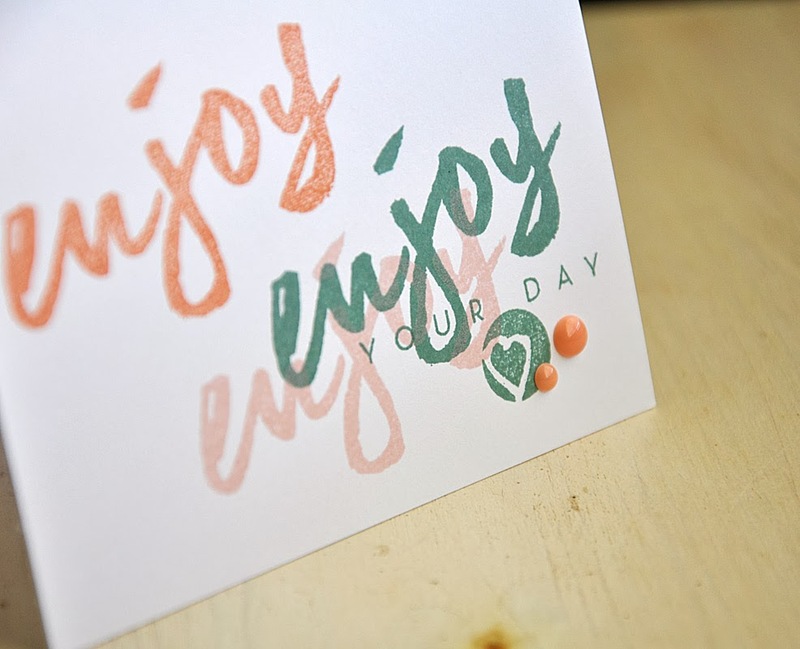 The "Happy" sentiment was stamped onto the top portion of a die cut panel, die cut using the smallest die from the Tipped Tops die collection. Only the top portion was attached and the rest was cut away by hand. Then finished this card off with a sprinkling of coordinating sequins. As I mentioned above, this set is great for creating strong focal points. 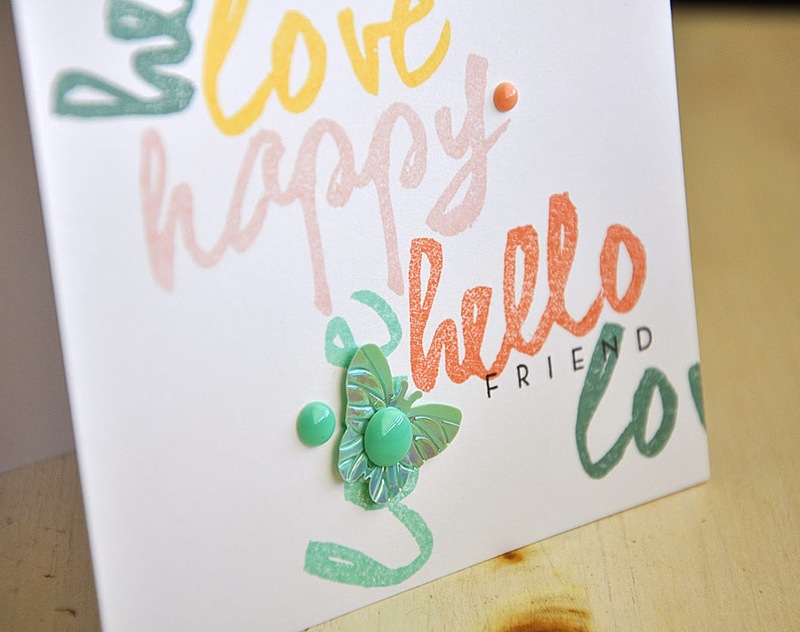 A strong focal point is sometimes all you need when creating a simple one-layer card. 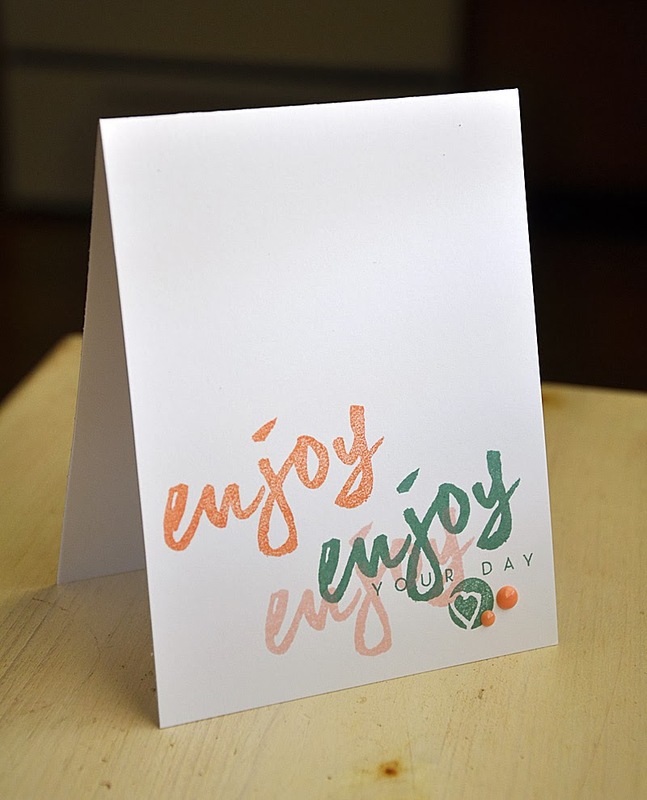 This card was stamped using the heart circle, "enjoy" and "your day" from the Wet Paint set. I simply stamped them in a color combo of Ocean Tides, Sweet Blush and Melon Berry. Last but not least... a background! Such an easy technique that takes no time at all. I chose a few words included in the set and stamped them, nestled one next to the other, across the front the card base. Sticking with the color combo of the day... Sweet Blush, Melon Berry, Ocean Tides, Aqua Mist and Harvest Gold. Then finished the card off with a butterfly sequin and enamel dots from my stash. Well, that concludes today's look at Wet Paint. Just remember... this set will be available for purchase through Papertrey Ink, beginning March 15th. Now, be sure to visit Nichole Heady for even more peeks at this set. Also, Heather Nichols, Dawn McVey, Melissa Bickford, Erin Lincoln and Lizzie Jones have peeks to share with you of their newest sets and dies for the month. Betsy Veldman and Melissa Phillips has even more to share with you today too! All of your cards are WONDERFUL, Maile, and I know this set will be in my cart on release night!!! It's SO GOOD to have you back! I love, love, love your cards! So cute! Welcome back, Maile! Love your CAS look! Welcome back. Welcome back Maile! Love how you showcased this set!!!! Welcome back Maile and fabulous projects today! Great to have you back, Maile, and knew you would hit it out of the park with Nichole's new Wet Paint. Love your designs and color combo! Welcome back!! I love what you did with this set. SO fun!! 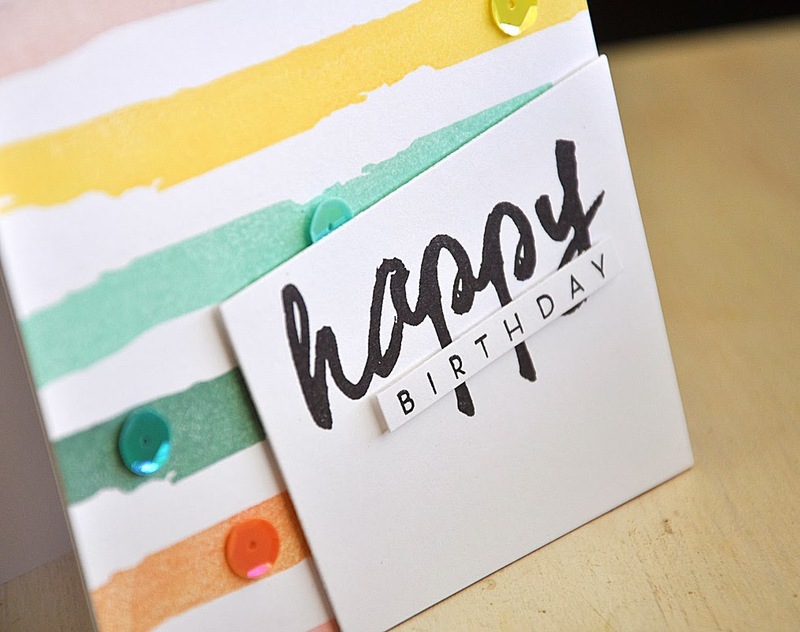 Fabulous cards, Maile! Can't wait to get this set for myself! It is awesome! Oh, this set looks fabulous and you showcased it beautifully, Maile! Welcome back Maile, you were missed! Your cards are wonderful and I love the way the set pairs with Watercolor Wonder. Love this set! What fun it will be to work with! I just love the cards. The set is amazing. I also love your color choices. Love this set totally. A fanatical user of watercolours, this is soooo suited. Cant wait. So simple...and yet so beautiful. Thanks for the inspiration! Oh so pretty! I love the colors! They look good enough to eat! Oh, Maile - I am SO very glad to have you back!! Congratulations on your little wee one and welcome back to the world of PTI. :) This set looks amazing in all your cards and you have showcased it perfectly. I can not wait to get these sentiments in my hands and start playing!! Love this set! Can't wait to see the whole set! Welcome back, Maile! You were missed. I love all the cards. they are all awesome!!! Wonderful cards! Can't wait to get this set when it is released. Such beautiful spring like colors, we need that where I live. Wonderful cards.